The artist Hitman Gurung is well known for his powerful socio-political artworks, and in this case, with photography. His paintings have drawn attention to the corruption in the country and to the plight of migrant workers, which is a topic that he has been passionately documenting over the last three years. The issue is also a very personal one for the artist as traditionally the Gurungs, as with some other Nepali ethnic groups, have a long history with joining foreign armies and Hitman himself has been pressured by his family to work abroad. The artist states “For me different genres of art, material, and medium have their own characteristics and essence. In the process of my work, I choose the genre which relates to my concept the most. I have used photographs with different approaches such as photo collage, photo montage, installation and I also have merged it with other mediums of art”. Over the last twenty-five years, political turmoil and lack of economic opportunities in the country have propelled an exodus of Nepalis. While looking for foreign employment and better pay, many have experienced exploitation and abuse. And yet, international labour migration has grown exponentially over the past decade. According to Nepal’s Foreign Employment Promotion Board (FEPB) around 1700 Nepali leave the country each day – sending back their income to families they have left behind. According to the World Bank, remittance to Nepal is one of the highest in the world. Sadly, migrant labourers are often subject to exploitation – abuse, slavery and untimely deaths are hence, common among migrant workers from Nepal. FEPB estimates 726 migrants perished overseas in 2012, an increase of 11% over deaths in 2011. Contrary to these nationally accepted figures, the advocacy group, Pravasi Nepali Coordination Committee (PNCC) claims the real death toll to be around an astounding 1,300 people. Incidentally, the number of deaths among Nepali migrant workers remains the highest among Asian countries. Migrants dream of better lives. Some never return from working towards this dream. Depending upon the company, it can take up to 3 years for a dead body to be parceled back to Nepal. Still 3 to 4 coffins arrive at Nepal’s international airport each day. Hitman’s artpiece Everyday at the Airport uses a coffin that brought back the body of migrant labourer and was sourced from a crematorium. This work is part of a powerful larger body titled, I Have to Feed Myself, My Family, My Country. In multi-cultural Nepal, divergent yet vigorous last rites are observed. For workers that die abroad such considerations are never made, their backgrounds are ignored and their identity is reduced to contents of a wooden box. 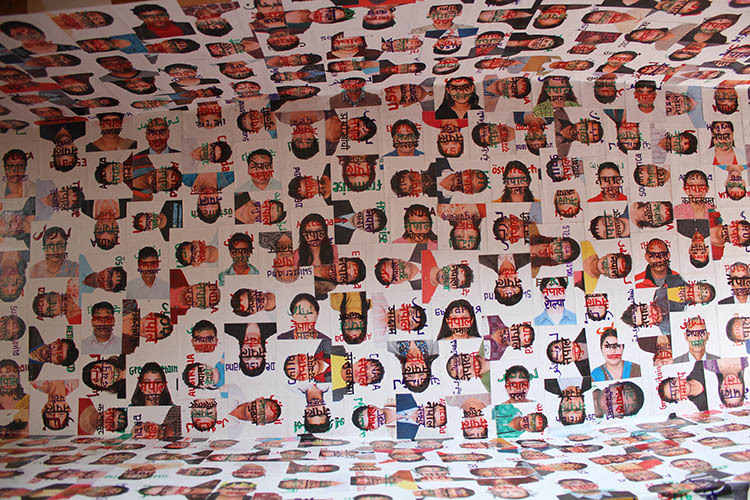 The interior of the installed coffin in this artwork is painstakingly lined with a selection of photographs of men and women who have applied for work visas. Their nameless portraits and identities are deliberately obscured by calligraphy which indicates the destination that migrant labourers journey to. This information is handwritten in the lingua franca of that country and is strategically placed on their forehead or cranial region. The country of origin of the migrant labourer Nepal is written in bold Nepali. This text occupies the middle or the heart of the photo portrait, while the place of birth of each “worker” is written out on the bottom half of each photograph, as if to signify that the place is where all hopes and dreams are born. Each of these photographs have been carefully collected, cut, pasted, written upon and laminated with fiber glass, charting a national narrative. On the exterior of the coffin, tiny prints of passport photos belonging to the same people have been used. A distorted map of the world hand drawn in red by the artist highlights the countries where large numbers of Nepali workers have perished. This installation reflects the hopes and aspirations of migrant workers as well as the misery of death often experienced by families of those who never return. 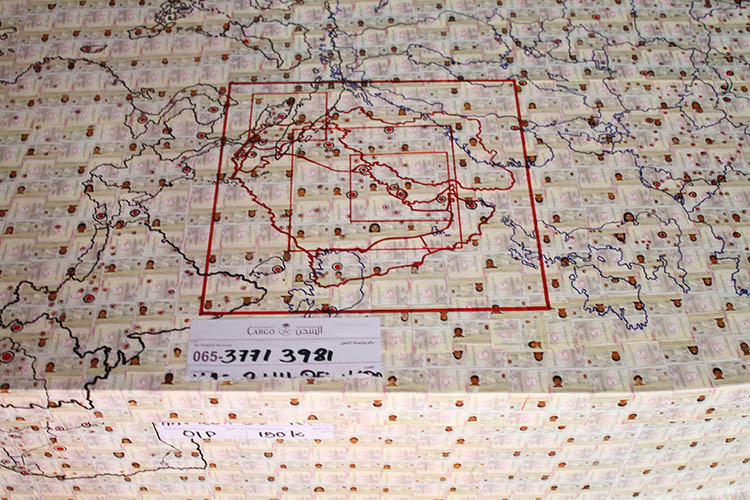 The other work titled 9:11 am is also from the series of I Have to Feed Myself, My Family and My Country. 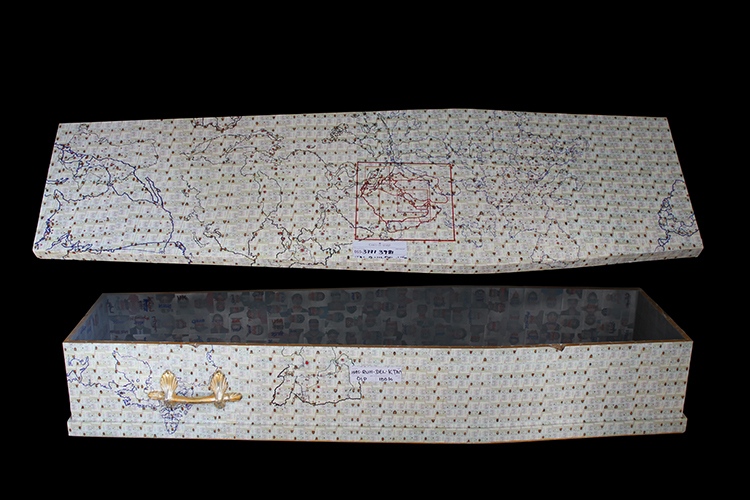 The painting refers to the time difference between Nepal and Qatar which is 2 hours and 45 minutes.When the first massive earthquake hit Nepal it was 11:56 am in Nepal and 9:11 am at Qatar. On 25 April, 2015 and 12 May, 2015 two earthquakes struck the Central Region of Nepal in which 8969 people lost their lives, 500,000 homes were destroyed and more than a million people displaced. Half a million Nepalese migrants are working and living in Qatar. Many of them are involved in building structures for the upcoming Word Cup 2022. After the earthquakes and 300 aftershocks hit Nepal, many migrant workers lost their loved ones and their property. Some were traumatized to learn that their entire village had been leveled by the earthquakes. But even in this time of emergency, massive loss, trauma, insecurity and panic – these migrants were not allowed to return to their country, to their loved ones. Nepal was in desperate need of help. Hundreds of lives could have been saved in Nepal had there been enough manpower on the ground to help. The irony is that these grief stricken migrant labourers were instead working to build the ultra luxurious stadium for the world cup. To narrate this bitter and tragic story Hitman uses multiple photographic images of the devastation caused by the earthquake that are scanned and digitally printed in black and white on canvas. These stark photographs expose us to a backdrop of devastation and tragedy. The backdrop also pays homage to the dead and to the resilience of the Nepali people. Against this narrative of sorrow is a self-portrait of the artist standing at the very centre of the maelstrom. Dressed as a construction worker, the artist visually relives the agony of the Nepalis working in Qatar. Though his hands and face are deliberately rendered in black and white, in acknowledgement of the devastation captured in black and white in the background, the artist’s eyes, red-rimmed with grief, are intended to unsettle the viewer. 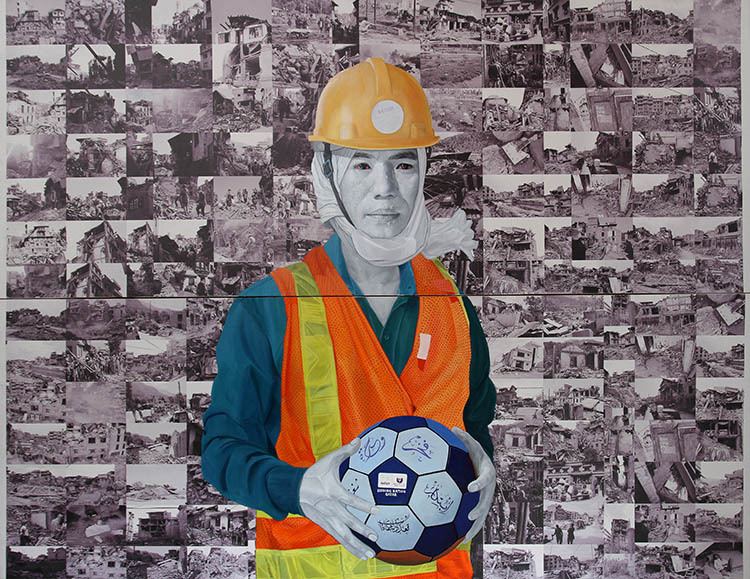 The black and white portrait of the artist is in stark contrast to his work uniform, the hard yellow hat, blue shirt and fluorescent vest and more importantly, the football with the logo of the World Cup 2022, is symbolic of the blood sweat and tears shed by Nepalis to bring home money at the cost of losing lives or being unable to save any.